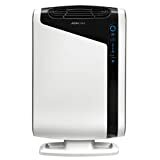 Fellowes - Aeramax DX95 : Air Purifier Review • The Air Geeks, reviews of air conditioners, dehumidifiers and air purifiers. Fellowes is a manufacturer that offers effective and affordable air purifiers. This manufacturer has impressed us yet again with its AeraMax X95 air purifier. It is a device that has almost everything going for it: design, efficiency, performance and above all, intelligence! You’ll understand the AeraMax DX95 has caught our eye : what is more, it enjoys a patented technology for its innovative filtration system. It has attracted our attention because it seems to have much to offer. if you are interested in this unit, you will find essential information below to help you see if this device is right for you. The DX95 AeraMax Fellowes has an outstanding 3-year warranty. For a device of this type, it is important to have a warranty that lasts for several years to that you can have peace of mind that your investment will last. The opinions of those who have adopted the solidity are fairly mixed. Some have reported that the device is solid and resistant to shocks, while others find it to be too fragile. Despite the mixed reviews, we believe you can rely on this air purifier for clean and healthy air at home. Indeed, it has several convenient features and an effective filtration system. According to Fellowes, model AeraMax DX95 is able to purify the air up to 99.97% and based on its elaborate filtration system, it is quite possible. The AeraMax DX95 has 4 levels of filtration system and includes the AeraSafe system, AeraSmart sensor, a HEPA filter and an active carbon filter. With this air purifier, you can say goodbye to odors, pollen, VOC, mold, fungi, bacteria, viruses, germs, pet dander and dust mites. This device is the best option for people who suffer from allergies. 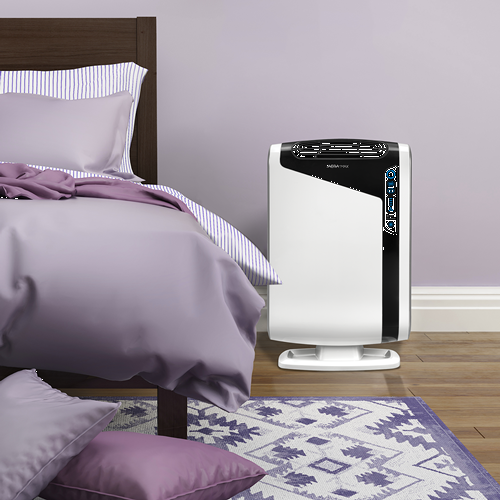 The air purifier AeraMax DX95 was created for rooms up to 28 square meters, but it can easily purify a room of 30 square meters. In fact, tests show that it can easily clean the air of a room of 140 square meters in 1 hour! It has an automatic mode which allows it to assess the level of pollution in the air and adapt its operation. This feature makes life easy since no special handling is required. If desired, it is still possible to adjust the device purification intensity because it has four speeds and also Aera + mode for accelerated operation. The AeraMax DX95 has a power of 86W, which is somewhat high for an air purifier. Despite the higher energy usage, it is unlikely to have a huge impact on your electricity bill. While it does generate noise when it is in use, it is quite bearable. Thankfully, you should still be able to sleep peacefully at night. It should also be noted that this device is very easy to maintain. Simply clean it from time to time to remove dust. We also advise that you monitor its indicators that let you know when its filters are saturated. This happens only four times a year. In addition, it is easy to find replacement filters on the market. This device has been designed to offer a convenient solution to its owners. Its high quality 4 level filtration system that can restore pure and healthy air in your home. Its Aera + mode is very useful for people with allergies because it purifies air very quickly. Its LEDs air pollution indicators and automatic mode are two very popular features. We live on one floor of a house in New York City, which is a constant assault on the senses. We hear, even feel, and unfortunately smell just about everything that goes on in our neighborhood. This air purifier is one great source of relief. Our first impression upon receiving this item was that it seemed bulky compared to the models we saw in stores, and that it essentially was a circulation unit with a filter like you might have in your air conditioning ducts in a house. But after actually using it, my wife and I realized it's a very high capacity air purifier with a lot of great features that we really love. For starters, it doesn't just filter air. It also sends out ions, which for us, coming from Japan, is an essential function which justifies the higher price tag. Negative ions are only created in nature by flowing water, and those of us who are used to products which have this feature definitely appreciate it. It simply makes the air fresher in addition to cleaner. The automatic sensor function is our other favorite feature. It automatically senses anything from smoke, to sweat, to your neighbor's cooking. Our neighbor uses a lot of spices in their seemingly nightly frying of fish, and we were suprised at how this filter removes the smell almost entirely. It also senses when I come home from hours of cycling, stinking of sweat. We are suprised at how well it detects odors and eliminates them. But silence is probably the most surprising thing about it. It couldn't possibly be any quieter. It makes us think there must be some model of air conditioner which is as quiet as this unit is. Bottom Line: At first glance or a demo, you might think this isn't a very sophisticated appliance, but you would be wrong. It functions far better than expected, and if you have been using spray air fresheners in your home until now you might want to try doing away with them and trying one of these instead." I absolutely Love this product! It's completely automatic, just plug it in and let it do the work. I would definitely recommend this to anyone who suffers from allergies!" We find that the AeraMax DX95 Fellowes is one of the best air purifiers on the market and offers a very decent value. It has a sleek design and is reliable and smart, with four levels of filtration and an automatic mode. To polish it off, it is easy to maintain. With it, you can expect to breathe clean and healthy air in your home and you can sleep peacefully because it makes only minimal noise during normal operation. Thanks to its sophisticated filtration system, you can say goodbye to pollutants and allergens such as pollen, smoke, pet dander, odors and even bacteria, viruses and mold. Naturally, we recommend it!